In 2007, archaeological examination of a privately-held parcel of land in Fishkill, NY, confirmed what local historians and others could not: the existence of a Continental Army burial ground where dozens, perhaps hundreds, of soldiers lie in unmarked graves. Shortly thereafter, the Friends of the Fishkill Supply Depot (FOFSD) was formed to advocate for the preservation of this sacred site. As our group progressed a strong effort was made to identify the soldiers buried in Fishkill. Countless hours were spent scouring muster rolls, hospital records, and other primary source documents in an effort to identify the soldiers. "We will not rest until we know the names of every soldier who lies in the burial ground" said chief researcher Judy Wolf. On December 8, 2011, the names of 25 soldiers were released to the press. As word spread, descendants of the soldiers began to contact our organization. One of these is Lee Carlson a descendant of Captain Archelaus Towne. Read an article about Lee and other descendants here. This past Memorial Day (May 25, 2014) we released the name of an additional soldier. Captain Beal of the 3rd New Hampshire regiment has a compelling story and was killed during a mutiny attempt on 7 Nov 1777. Read the full story Mutiny at Fishkill here. “With each new name that is identified, we revisit the history and honor of this sacred site” said Lance Ashworth, president of FOFSD. View our special interactive Tribute Wall or scroll down to view the names grouped by US state of enlistment. Recent additions are highlighted in gray. 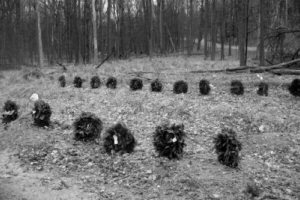 Note: This webpage is intentionally formatted in grayscale and will remain so until the day we can announce that the soldiers' burial ground has been acquired and preserved, once and for all. 6th Regiment Lt Col Gray’s Company d. 10 Aug 1779. Allen enlisted for 3 years on 11 February 1778. He was reported as sick in camp in May and then again at Fishkill from 17 June 1779 until he died on 10 August 1779.
fold3.com- Revolutionary War Records CT 6th Regiment (1777-80) Folder 113 pages 48, 51, & 54; Service Records pages 21, 23 & 25; Record of Service of Connecticut Men in the I) War of the Revolution, II) War of 1812, III) Mexican War. Hartford 1889 waroftheRevolution00recorich.pdf pages 207. 6th Regt Captain Asa Lay’s Company born 9 March 1751 in Middlesex, CT d. 24 Sept 1780, married with 3 young children. He was at the Battle of Bunker Hill, known as one of the rail fence men. He mustered into Captain Humphrey’s Co. in May 1778. Fell ill in Ely’s Co. in February 1780, transferred to Lay’s Co in September still hospitalized where he died of Camp Distemper on 24 September, aged 29 years, never getting to see his wife and children in those last 2 years, their only communication being messages to them by his fellow soldiers home on leave. fold3.com- Revolutionary War Records Ct 6th Regiment (1777-80) Folder 110 pages 119, 124, 127, 132, 137, 142, 147, 152, 157 & 162; Service Records pages 45, 47 & 57; Record of Service of Connecticut Men in the I) War of the Revolution, II) War of 1812, III) Mexican War. Hartford 1889 waroftheRevolution00recorich.pdf pages 209 & 492; Ancestry.com - Connecticut Birth Records pre-1870 (Barbour Collection)p. 66 & 67; Revolutionary War Pension and Bounty Land Warrant Applications of his wife Catherine and daughter Polly. 2nd Regiment Captain Ames Wallbridge’s Co. first enlisted in April 1777 to serve for 3 years. He fought at the Battle of Monmouth falling ill and reported sick at Fishkill September 1778 and dying on 29 Oct 1778 at the age of 23.
fold3.com- Revolutionary War Rolls, CT 2nd Regiment (1777-80) Folder 31 pages 58 & 63; Revolutionary War Service Record pages 29 & 31; Record of Service of Connecticut Men in the I) War of the Revolution, II) War of 1812, III) Mexican War. Hartford 1889 waroftheRevolution00recorich.pdf page161; Ancestry.com - Connecticut Birth Records pre-1870 (Barbour Collection) p. 27. 5th Connecticut Regiment, the late Captain Catlin’s Company d. 30 October 1778 after being sick at Fishkill since September 14th. fold3.com- Revolutionary War Records Ct 5th Regiment (1777-80) Folder 87 pages 50 & 55; Service Records page 34; Record of Service of Connecticut Men in the I) War of the Revolution, II) War of 1812, III) Mexican War. Hartford 1889 waroftheRevolution00recorich.pdf page 197. 6th Connecticut Regiment under Captain Samuel Barker, enlisted 25 December 1777 for the duration of the war. He was reported sick in June and admitted to the General Hospital at Fishkill in July. He died 5 August 1778.
fold3.com- Revolutionary War Records Ct 6th Regiment (1777-80) Folder 109 pages 15, 18,21, 24 & 29; Service Records pages 5, 7 & 10; Record of Service of Connecticut Men in the I) War of the Revolution, II) War of 1812, III) Mexican War. Hartford 1889 waroftheRevolution00recorich.pdf pages 209 & 621. 2nd Regiment Captain William Mannings Company, enlisted in February or March 1778 and was reported sick at Fishkill one week before his death on 21 September 1778.
fold3.com- Revolutionary War Rolls, CT 2nd Regiment (1777-80) Folder 26 pages 40 & 43; Revolutionary War Service Record pages 12 & 13. Record of Service of Connecticut Men in the I) War of the Revolution, II) War of 1812, III) Mexican War. Hartford 1889 waroftheRevolution00recorich.pdf page 161. 3rd Regt Captain Wills Clifts Co. He enlisted on 29 April 1777 for 3 years and was reported sick at Fishkill from 14 September 1778 until his death, the “exact date unknown,” but “presumed to be Oct 15th” at the age of 17. His brother William, enlisted months before Jesse and died 4 months after him, leaving their parents Moses and Mary Earl of Pomfret CT without child. fold3.com- Revolutionary War Records Ct 3rd Regiment (1777-80) Folder 49 pages 11, 14 &19; Service Records pages 9 & 12. Ancestry.com - Connecticut Birth Records pre-1870 (Barbour Collection) p. 145; Record of Service of Connecticut Men in the I) War of the Revolution, II) War of 1812, III) Mexican War. Hartford 1889 waroftheRevolution00recorich.pdf pages 173. Born in Plainfield, CT, Lt. Fellows was captured, held and brutally mistreated by Indigenous people in Canada at the Battle of Cedars and was later exchanged or escaped. He joined Hazen's Regiment and later died on December 10, 1779. He is a registered Society of the Cincinnati Officer and recognized by National Soc. of the Daughter of the American Revolution. He left behind his widow, Lois Stevens Fellows, and 6 children. Henry Sewall Information HENRY SEWALL was of the sixth generation in lineal descent when he enlisted as a soldier soon after the battle of Lexington. In the course of three of four campaigns he passed through the various subordinate grades to that of captain, which rank he sustained to the end of the war. He was in the battle of Hubbardston on the retreat from Ticonderoga, and in one of the skirmishes previous to the surrender of Burgoyne at Saratoga, of which event he was a witness. He wintered at Valley Forge in 1778, and served the remainder of the war in New Jersey and the highlands of New York. attended his funeral at Fishkill. Henry Sewall’s Journal, Microfilm- Massachusetts Historical Society; Barbour Collection Plainfield Vital Records 1699-1852 F p.141; fold3.com images # 16840569, 10126894, 9954933, 291772496. "Monument of the Soldiers of the War of the Revolution" dedicated by the D.A.R.- Melzingah Chapter - 1897. An African-American soldier from Saybrook, Freeman enlisted on 2 February 1780 in CT, 6th Regt Col. Meig’s Company for 3 years, but died Dec 1780 after being sick at Fishkill for 4 months. fold3.com- Revolutionary War Records Ct 6th Regiment (1777-80) Folder 115 pages 52, 54, 56, 58; Service Records pages 2, 52, 53 & 54; http://www.6thconnecticut.org/?page_id=909 Compiled from Connecticut’s Black Soldiers 1775-1783 by David O. White and verified with the Record of Service Connecticut Men in the War of the Revolution. The son of Israel and Ruth Brown Higgins, he was born June 26, 1731, in Eastham, MA moving to Middletown CT with his parents. He fought in the French and Indian War and was a Private in the 8th Company in the Lexington Alarm on April17, 1775. He was in Capt. Samuel Wyllys’ 3rd CT Regiment in Captain William Judd’s Company at the time of his death at Fishkill’s Hospital. He died on November 27, 1778 after being sick since September 10th. He was survived by six children. 3rd Regiment Captain Edward Eell’s Company. He enlisted on 23 April 1777 for the duration of the war, sick at Fishkill 19 November 1779 until his death on 6 April 1780.
fold3.com- Revolutionary War Records Ct 3rd Regiment (1777-80) Folder 50 pages 57, 62, 68, 73 & 88; Service Records pages 2, 46, 47 & 48. He was born in Woodstock, CT in 1732 and served as a nurse and died of smallpox at Fishkill in 1777. “Family of Ensign Nathaniel Johnson and Mary Hayward.” Also, “Genealogy of the Child, Childs, and Childe Families of the Past and Present…” page 422, by Elias Child, 1881. 1st Regiment Capt Elys Company, from New London, he enlisted 28 Feruary 1777, d. 10 July 1778 after being ill for 1 month. fold3.com- Revolutionary War Rolls, CT 1st Regiment (1777-80) Folder 6 pages 32, 64 & 67; Revolutionary War Service Record pages 32, 47 & 48. Record of Service of Connecticut Men in the I) War of the Revolution, II) War of 1812, III) Mexican War. Hartford 1889 waroftheRevolutionaryolution00recorich.pdf page 152. William Pollard served in Captain Amos Stanton's Company of Col. Henry Shelburne's Regiment. He and his regiment were at Fishkill from December 1777 until at least March 1778. He was listed as died at Fishkill on February 19, 1778.
fold3.com Revolutionary War Rolls, Continental Troops, Shelburne's Regiment folder 157 - pages 11, 14 & 17; Continental Troops Shelburne's Regiment Service Record page 7. An African-American soldier, legend says he was hit in the head with an icy snowball. He was in Col. Samuel Wyllys' CT Regiment. He was sick at Fishkill Hospital for 8 months until his death in February 1779. Putnam’s Revolutionary War Winter Encampment by Daniel Cruson p. 67-68; fold3.com Service Records images # 14714715 & 14714720. 2nd Regiment, Captain Mills Company, death reported Nov. 1778 time unknown. He was reported sick from 1 November 1777 and reported sick at Fishkill from May 1778 until November 1778.
fold3.com- Revolutionary War Rolls, CT 2nd Regiment (1777-80) Folder 27 pages 29, 32, 35, 38, 43 & 46; Record of Service of Connecticut Men in the I) War of the Revolution, II) War of 1812, III) Mexican War. Hartford 1889 waroftheRevolutionaryolution00recorich.pdf page163. 1st Regiment Capt Elys Company. Born 31 August 1719, died 14 July 1779 after tending the sick at Fishkill for a year, leaving a wife and 7 children. 6th Regt Captain Humphrey’s Company died 31 July 1779. He enlisted as a Private on 28 Feb 1778 in Captain Humphrey’s Company, appointed Drummer on November 1st 1778, became ill at Fishkill 12 July 1779 and died 19 days later. fold3.com- Revolutionary War Records Ct 6th Regiment (1777-80) Folder 111 pages 79 & 84; Service Records pages 7, 18, 19 & 21; Record of Service of Connecticut Men in the I) War of the Revolution, II) War of 1812, III) Mexican War. Hartford 1889 waroftheRevolution00recorich.pdf p.214. The son of Israel Shipman and Jane Wheeler from Saybrook, CT enlisted on 1 March 1778 in the 6th Connecticut Regiment, Captain Elisha Ely’s Company for 10 months. He was sick at Fishkill from September 14th until his death on 31 October 1778.
fold3.com- Revolutionary War Records Ct 6th Regiment (1777-80) Folder 111 pages 34 & 39; Service Records pages 8, 11 & 14; Record of Service of Connecticut Men in the I) War of the Revolution, II) War of 1812, III) Mexican War. Hartford 1889 waroftheRevolution00recorich.pdf pages 77 & 215. Enlisted 1 January 1777 into Captain Mill’s Company in the 2nd Connecticut Regiment for the entire war. He was reported sick in September 1778 and continued as such after being transferred into Captain Roger Alden’s Company until he was reported as “Dead time unknown” in May 1779.
fold3.com- Revolutionary War Rolls, CT 2nd Regiment (1777-80) Folder 27 pages 43, 46, 49, 253 & 256; Revolutionary War Service Record pages 34, 35, 37,43 & 44; Record of Service of Connecticut Men in the I) War of the Revolution, II) War of 1812, III) Mexican War. Hartford 1889 waroftheRevolution00recorich.pdf page164. Enlisted March 1777 in the 2nd Regiment Captain Mills Company. He was reported sick at Fishkill from 15 September 1778, then transferred to Captain Roger Aldens Company while still sick at Fishkill, mustered as such until being reported “Dead time unknown” in May 1779.
fold3.com- Revolutionary War Rolls, CT 2nd Regiment (1777-80) Folder 27 pages 27, 253 & 256; Revolutionary War Service Record pages 14,26, 29,30, 40 & 42; Ancestry.com - Connecticut Original data: Jacobus, Donald Lines,. The Bulkeley genealogy : Revolutionary. Peter Bulkeley, being an account of his career, his ancestry, the ancestry of his two wives, and his relatives in England and New England, together with a genealogy of his descendants through the seventh American generation. New Haven, Conn.: unknown, 1933. p. 539; Birth Records pre-1870 (Barbour Collection) Fairfield p. 143 & 144. He enlisted as a Private in the 1st Maryland Regiment Captain Levin Winder’s Company on 20 May 1778 for 3 years. He died on 3 September 1778 at Fishkill. His surviving children received his Bounty Land in 1828.
fold3.com- Revolutionary War Rolls Maryland 1st Regiment (1777-80) Folder 4 page 173, Maryland Service Records pages 2 & 3, Maryland Pension file pages 6 & 7; Ancestry.com - Muster Rolls and Other Records of Service of Maryland Troops in the American Revolution, 1775-1783: Volume 1 page 78. 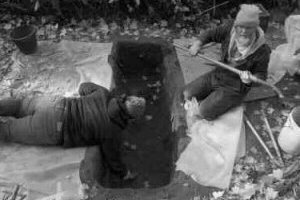 Professional archaeologists examine features found at the Soldiers' burial ground in Fishkill, NY - April, 2007. Atchinson was from Prince George’s County. He was 18 years old when he enlisted in Captain Bowie’s Company, part of the Flying Camp on 27 July 1778 for 9 months. He died at Fishkill on 23 September 1778 in Lieut. William Bruce’s Company of the 1st Maryland Regiment of Foot at Fishkill. fold3.com- Revolutionary War Rolls Maryland 1st Regiment (1777-80) Folder 4 page 57, Maryland Service Records page 2; Ancestry.com - Muster Rolls and Other Records of Service of Maryland Troops in the American Revolution, 1775-1783: Volume 1 page 160. 2nd Maryland Regiment of Foot, Col. Thomas Price, Captain John Eccleston's Company. Bryan died at Fishkill between November and December 1778. Muster Roll and Service Record on fold3.com image #17096578 & #10109930. Davis enlisted in Lieut. John Gassaway’s Company of the 2nd Maryland for 3 years and died 9 September 1778 at Fishkill. fold3.com- Revolutionary War Rolls Maryland 2nd Regiment (1777-80) Folder 13 page 22; Maryland Service Records page 2; Ancestry.com - Muster Rolls and Other Records of Service of Maryland Troops in the American Revolution, 1775-1783: Volume 1 page 101. Joseph Deale of the Maryland Artillery, served with the Continental Troops in the 1st Regiment of Artillery commanded by Col. Charles Harrison, Captain William Brown's Company. He enlisted on 22 November 1777 for 3 years and died at Fishkill 23 September 1778.
fold3.com Revolutionary War Rolls, Continental Troops, 1st Regiment of Artillery Folder 21 - page 31; Continental Troops Service Record pages 17 & 18. William Dyer of the Maryland Artillery, served with the Continental Troops in the 1st Regiment of Artillery commanded by Col. Charles Harrison, Captain William Brown's Company. He was recorded sick on September 24th and died at Fishkill October 12, 1778.
fold3.com Revolutionary War Rolls, Continental Troops, 1st Regiment of Artillery Folder 21 - pages 31 & 34; Continental Troops Service Record pages 18 & 19. 2nd Maryland Regiment Captain Ely Dorsey’s Company. He enlisted 22 March 1777 and died at Fishkill on 9 September 1778.
fold3.com Revolutionary War Rolls Maryland 2nd Regiment (1777-80) Folder 11 page 31; Maryland Service Record p.8; Ancestry.com - Muster Rolls and Other Records of Service of Maryland Troops in the American Revolution, 1775-1783: Volume 1 page 118. 2nd Maryland Colonel Thomas Price ‘s Regiment of Foot, Captain John Eccleston’s Company. He died at Fishkill between November/December 1778. Muster Roll and Service Record on fold3.com- images #10109930, #17092347 & #10109930. He enlisted 23 May 1778 in Captain John Davidson’s Company of the 2nd Maryland Regiment. He died at Fishkill 3 December 1778.
fold3.com Revolutionary War Rolls Maryland 2nd Regiment (1777-80) Folder 9 page 52; Ancestry.com - Muster Rolls and Other Records of Service of Maryland Troops in the American Revolution, 1775-1783: Volume 1 page 119. 2nd Maryland Colonel Thomas Price‘s Regiment of Foot, Captain John Eccleston’s Company. Hubbard died at Fishkill between November and December 1778. Muster Roll and Service Record on fold3.com images #17094041 & #10109930. 1st Maryland Regiment of Foot, Captain Levin Winder’s Company enlisted on 7 September 1777 for 3 years dying on 3 Sept 1778 at Fishkill. fold3.com- Revolutionary War Rolls Maryland 2nd Regiment (1777-80) Folder 4 page 173, Maryland Service Records page 2; Ancestry.com - Muster Rolls and Other Records of Service of Maryland Troops in the American Revolution, 1775-1783: Volume 1 page 160. Turner joined the 2nd Maryland Regiment, Captain John Davidson’s Company 6 July 1778 for 9 months. He died at Fishkill 30 September 1778.
fold3.com Revolutionary War Rolls Maryland 2nd Regiment (1777-80) Folder 4 page 57; Service Record pages 2 & 4. 13th Massachusetts Edward Wigglesworth’s Regiment, Willington’s Company. Fenton died of a wound on March 29, 1780. Henry Sewall Information HENRY SEWALL was of the sixth generation in lineal descent when he enlisted as a soldier soon after the battle of Lexington. In the course of three of four campaigns he passed through the various subordinate grades to that of captain, which rank he sustained to the end of the war. He was in the battle of Hubbardston on the retreat from Ticonderoga, and in one of the skirmishes previous to the surrender of Burgoyne at Saratoga, of which event he was a witness. He wintered at Valley Forge in 1778, and served the remainder of the war in New Jersey and the highlands of New York. attended his funeral at Fishkill. Henry Sewall’s Journal, Microfilm- Massachusetts Historical Society; Massachusetts Soldiers and Sailors in the Revolutionary War, Volume 5 p.615 & 674; Pension file pages 2 & 6 on fold3.com. √ Private Josiah Graves Sr.
Josiah Graves Sr. and his son, Josiah Jr. both enlisted March 1, 1777 in Captain Watson's Company, Col. Greaton's 3rd Massachusetts Regiment. Both were taken ill with Small Pox, Josiah Jr. came close to death but recovered. The Muster Roll taken in September 1777, states Josiah Graves Sr. died on July 25, 1777 yet the Massachusetts Soldiers and Sailors in the Revolutionary War archive sites July 20, 1777 a difference of 5 days. The letter of Dr. Ledyard (Fishkill) to Dr. Cutter (Peekskill) leads us to trust the latter date. fold3.com Revolutionary War Rolls, MA 3rd Regiment Folder 4 - pages 198 & 206; Service Record page 8; MA pension file; Josiah Graves Jr. pages 13 & 14; "Massachusetts Soldiers and Sailors in the Revolutionary War: A Compilation of Archives," Volume VI page 752. Sgt. Jackman served in Col. Ebenezer's Corp of Artillery and Crane's Artillery. He was promoted from Matross to Sergeant on August 4, 1778. He was listed as sick from Sep. 1778 through December of that year. In July 1779, he is reported sick again at Fishkill hosptial and dead the following month. fold3.com Revolutionary War Rolls, Continental Troops, 3rd Regiment of Artillery Folder 55 - pages 36 & 40; Corps of Artillery Folder 64 - pages 19, 23, 24 & 26; Continental Troops Service Record pages 3 & 4; Service Records Steven's Corp Artillery pages 11, 12 & 13; Massachusetts Soldiers and Sailors Volume 18, page 656; The Army Lineage Series, The Continental Army, Robert K. Wright, Jr., Center of Military History, U.S. Army Washington DC 1983, page 339. He drowned at Fishkill about May 13, 1782. His body was recovered about 10 days later. Henry Sewall Information HENRY SEWALL was of the sixth generation in lineal descent when he enlisted as a soldier soon after the battle of Lexington. In the course of three of four campaigns he passed through the various subordinate grades to that of captain, which rank he sustained to the end of the war. He was in the battle of Hubbardston on the retreat from Ticonderoga, and in one of the skirmishes previous to the surrender of Burgoyne at Saratoga, of which event he was a witness. He wintered at Valley Forge in 1778, and served the remainder of the war in New Jersey and the highlands of New York. attended his funeral. fold3.com Rev War Rolls Massachusetts 15th Regiment (1777-80) Folder 19 page 208. Rowe was born in Gloucester, MA. He enlisted in Col. Michael Jackson's Regiment (Mass. ), April 5, 1777. He died at Fishkill, March 8, 1778. Revolutionary War Re-enactors pause for a "Moment of Silence" to honor the soldiers buried at Fishkill, 2011. “Massachusetts Soldiers and Sailors in the Revolutionary War: A Compilation from the Archives," Volume XIII. Published by Wright and Potter Printing Company, Boston, 1905. University of Massachusetts at Amherst Library. 16th Massachusetts under Colonel Lee, Captain Jonathan Drown’s company. He drowned June 19, 1778 in Fishkill Creek, under water only a short time. Much pain was taken to save him, but in vain. American Advertiser & NY Packet 25 June 1778; Massachusetts Soldiers and Sailors in the Revolutionary War, Volume 13 page 740; Service record on fold3.com image #14088235, Muster Roll image #10284039. He enlisted 23 July 1779 for 9 months in the 3rd Regiment Col. Greaton, Captain Watson’s Company. He was sick at Fishkill from 16 October until his death on 10 Dec 1779.
fold3.com- Revolutionary War Rolls, CT 3rd Regiment (1777-80) Folder 4 pages 300 & 305; Revolutionary War Massachusetts Service Records pages 3 & 4. He was born in Mansfield, Massachusetts. Served under Colonel Thomas Marshall’s Massachusetts Regiment. He was sick at Fishkill in March 1779 and died April 14, 1779. He has a commemorative headstone in Bolton, Mass. Massachusetts Soldiers and Sailors in the Revolutionary War- Volume14, p. 281; fold3.com Service Record image #17474454; Muster Roll image #10115292. He enlisted for 3 years in Capt John Williams Company, 12th Massachusetts Regiment and was on command at Fishkill on June 14th and reported dead 2 days later on 16 June 1779. Massachusetts Soldiers and Sailors in the Revolutionary War- Volume 14, p. 327-328; fold3.com Massachusetts 12th Regiment Service Record page 4; Revolutionary War Muster Roll Mass 12th Regiment (17778-80) Folder 17 page 213. He was born January23, 1758, the son of Jasper and Grace Stone of Shrewsboro, Massachusetts. He died while in Continental Army service at Fishkill Hospital, 20 Dec. 1777. He was engaged for the town of Falmouth, Massachusetts under Colonel Peter Noye’s. He died of smallpox at Fishkill, 1777. He was born May 19, 1734 and died of dysentery and fever at Fishkill, December 1, 1779. Massachusetts Soldiers and Sailors in the Revolutionary War- Volume 13, p. 417 & Volume 15, p. 918-919; “The Massachusetts Magazine, Published Quarterly,” Volume II, page 218, 1909. Allen County Public Library Genealogy Center. Also, “History of Hillsborough County, N.H.,” published by J.W. Lewis Co., Philadelphia, 1885. Captain Beal was killed at Fishkill during a mutiny attempt on 7 Nov 1777. Read the full story Mutiny at Fishkill here. He left behind a wife and two children. May he rest in peace. Sources: Israel Putnam to Washington, Fishkill, 7 November 1777, Correspondence of the American Revolution, 2:31-32, courtesy of Joseph Lee Boyle; The Beale Family of Maine", written by Stackpole; Stearns, Ezra S. History of Plymouth, New Hampshire Vol. 1 (Cambridge, Mass. : University Press, 1906), 154-55; Five Straws Gathered from Revolutionary Fields (Cambridge, 1901), 20, courtesy of Joseph Lee Boyle; History of the Town of Wilton, Hillsborough County, New Hampshire Lowell, Mass: Marden & Rowell 1888. page 248. Courtesy of Joseph Lee Boyle; The Farmerâ€™s Cabinet, 22 March 1839, Volume 37, Issue 30, page 1. Joseph Gray narrative, Third NH. Alexander Hamilton to Washington, 10 November 1777, Sparks, Correspondence, 2:33.; Alexander Hamilton to Washington, Harold C. Syrett and Jacob E. Cooke eds., The Papers of Alexander Hamilton, Vol 1: 1768-1778 (Columbia University Press, 1961), 358; Muster Roll 3rd New Hampshire Regiment (1776-80) Folder 28 page 8. Josiah, the son of William Comstock Information The Comstock's were a large family of early settlers who migrated to America from England. Josiah was the oldest child and left behind 5 siblings; Lydia, Mary, William, James and Lucy. Source: A History and Genealogy of the Comstock Family in America, enlisted on 20 April 1778 for 3 years at the age of 18. He joined the 3rd New Hampshire, Captain Ellis’ Company. He collected a Bounty of £ 20. His hometown, Gilsum, NH had 49 males over the age of 16 in 1775 and 20 of them went off to war. Private Comstock was sick at Fishkill from July 1778 until he died 18 January 1779.
fold3.com- New Hampshire 3rd Regt (1776-80) Folder 32 p. 28,31,34, 37,40,43,46; NH 3rd Regt Service Records Josiah Comstock p. 3; The State of New Hampshire Rolls of Soldiers in the Revolutionary War 1776 to May 1777 compiled by Isaac W. Hammond 1885 page 646. http://archive.org/stream/provincialstatep1885newh#page/646/mode/1up; Ancestry.com- A History of the Town of Sullivan, New Hampshire 177-1917 by Rev, Josiah Lafayette Seward, D.D. Volume 1, pages 114, 208, 307, 357, 506, 508. New Hampshire 2nd Rgt Capt. Moses Dustin's Company. Downs enlisted in Captain Blodgett’s Company on 12 November 1776, mustered 21 February 1777 for 3 years. He received £ 20 in State Bounty. He was from Hampton, NH. Downs was sick at Fishkill from September 1778 until he died 1 Jan 1779. There is a note in his Service Record that says: "The Balance due to the Heirs of Robert Downs who was a Private 7th Co. 2 Rt New Hamp. Line appears to be forty six pounds, four shillings and four pence. Ex Josiah Gilman Jun." “The History of Hillsborough, N.H., 1735 – 1921,” by George Waldo Brown, Volume I, page 142. Published by John B. Clarke Company, 1921. Harvard College Library. Jonathan was born in 1758 and came from Barnstead, New Hampshire. He had a dark complexion, dark hair, dark eyes. 5 ft 6" tall. He first mustered into 1st New Hampshire Regiment Capt. Amos Morrill Company on 1 July 1777. Hugh Thornton (below) was also in this company. Jack was left sick at Fishkill some time between September 1777 and January 1778 when his Company marched to Valley Forge. He remained at Fishkill sick until his death on 4 March 1778 at the age of 20.
fold3.com -Muster Roll 1st Regt NH (1777-1780) Folder 2 page 112 also Folder 8 p 10, 13,22, 27; Service Records 1st NH Regt 15; History of the First New Hampshire Regiment in the war of the revolution on openlibrary.org p. 146 http://www.archive.org/stream/historyoffirstne00kidd#page/146/mode/1up The State of New Hampshire Rolls of Soldiers in the Revolutionary War 1776 to May 1777 compiled by Isaac W. Hammond 1885, p. 603. 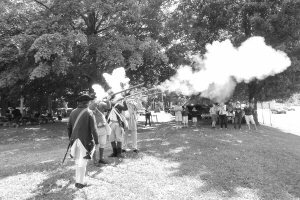 Musket fire signals the start of interpretive walks from the Van Wyck Homestead to the Soldiers' burial ground, 2012. Levi Lampre from Leavittstown, New Hampshire enlisted 20 January 1777 for 3 years in the 3rd New Hampshire, Captain Isaac Frye’s Company. He was promoted to Sergeant on 12 September 1778 in Captain Weare’s Company. He was reported as sick at Fishkill in October 1779 and died on 10 November 1779. Needham, age 26, from Wilton, NH enlisted in 2nd Company 1st Battalion New Hampshire in March 1777 for 3 years and received a State Bounty of £ 20. He was sick at Fishkill from September through December 1778 and reported dead 2 January 1779 (28 years old). His heirs received payment of one pound and seven shillings on 23 October 1780.
fold3.com New Hampshire 1st Regt (1777-80) Folder 12 pages 37,40, 43 & 49. The State of New Hampshire Rolls of Soldiers in the Revolutionary War 1776 to May 1777 compiled by Isaac W. Hammond 1885, pages 574, 597. New Hampshire 2nd Regiment, Captain Roswell's Company. He was sick at Fishkill for at least a few months before dying on 10 February 1779. He was born in Rochester, NH, the son of Abraham and Abigail Bickford Pearl. He enlisted at Dover on 24 May 1777 at the age of 17 for 3 years and received a Bounty of £ 20.
fold3.com 2nd New Hampshire Regiment (1776-83) Folder 25 pages 9,15,17 and 19; Service Record New Hampshire 2nd Regiment Simeon Pearl page 12. Private Perry was from Hampstead, New Hampshire, enlisting at Beal, NH for 3 years on 4 January 1777 in Capt Beal's Co. 3rd Rgt NH. He was being paid £ 40 per month. He was sick at Fishkill from February 1778 until he was listed as dead on 1 June 1779. 1st New Hampshire Regt- Thornton enlisted on 8 March 1777. He was from Merrimack, NH which borders Bedford, his birthplace on 5 May 1759, the son of William Thornton. He was left sick by his regiment at Fishkill 10 Jan 1778, died either 10 Feb 1778 or 1 March 1778 Fishkill at the age of 19. The Regimental Records show he was discharged on 1 March 1778. James White was from Portsmouth NH enlisted on 3 January 1777 for the duration of the war. He mustered on 27 Jan 1777 into the 3rd New Hampshire Regiment, Captain Zachariah Beal's company. He was given a Bounty of £ 20. He was reported sick at Fishkill in January 1778 until April 1778. Later he was reported dead on Jan 20 in the May 1778 Muster Roll dated June 2nd at Valley Forge. Godwin was a Marine Captain of the Lady Washington Information Lady Washington, named in honor of Martha Washington was a row galley (a term used by the early United States Navy for an armed watercraft that used oars rather than sails). Built in the spring of 1776 for the defense of the Hudson River, the Lady Washington remained active through June 1777 and helped capture about a dozen enemy warships before the permanent British occupation of New York City during the Revolutionary War., wounded in action and brought to Fishkill. His 3 sons were in the 5th NY regiment at Fishkill when he died of his wounds February 9, 1777. Captain Godwins' son Henry is listed in the State of New York and is buried near his father. History of Paterson and Its Environs by William Nelson and Charles A. Shriner, NY & Chicago; Lewis Historical Publishing co. 1920 Volume II, p, 65-68. Served in Eduard (Edward) Lounsbery’s 2nd NY Regiment. Benson was sick in the hospital at Fishkill October 7, 1778 and died 3 days later. fold3.com - Service Records NY 2nd Regiment B-Benson, William p. 7 &30. Muster Roll 2nd NY Folder 28 page 107. Served in Capt. McKeen's Company Col. Goose Van Schaick 1st NY Regiment. He enlisted March 27, 1778 and he was sick and an invalid at the Fishkill Hospital from April 1778 until he died on October 24, 1778.
fold3.com - Rev War Rolls Folder 13 page34. Wreaths from the annual Wreaths Across America event mark the graves of Revolutioary War soldiers, 2013. Son of Captain Abraham Godwin, a lawyer near Fishkill prior to the war. 5th NY Regiment, captured at the Battle of Fort Montgomery, October 6, 1777. His 2 young brothers escaped capture. He was placed on a prison ship in NY Harbor, exchanged in 1780, continued to serve his country until his death on March 10, 1782, buried near his father. History of Paterson and Its Environs by William Nelson and Charles A. Shriner, NY & Chicago; Lewis Historical Publishing co. 1920 Volume II, p, 65-68; NYG & B Volume 121 1990 p238-239 120:70; fold3.com Lists of Prisoners Held on long Island images #9971950, #9971952, #9971957, #9971959 NY Genealogical and Biographical Record- Volume 121 1990 p.238-9; 12:70; New York Packet and American Advertiser published by Samuel Loudon 14 March 1782. He served in Capt. Titus' 4th NY Regiment. He died in service at Fishkill on July 21, 1777. “Documents Relating to the Colonial History of the State of New York,” page 548, Volume XV. Edited by Berthold Fernow, 1855. He was taken prisoner at Fort Montgomery 6 Oct 1777, exchanged Dec 1780; subsequently served with Lt NY Levies. 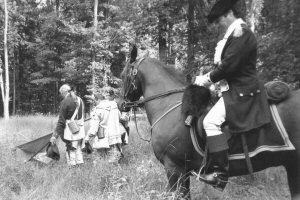 He was attached to Col. Dubois’ Regiment, stationed at Fishkill when on October 10, 1782 the horse he was riding stumbled. He fell off the horse, hit his head on a rock and later died. Abraham B. Martling went by horseback to Haverstraw 20 miles away to bring Mrs. Margaret McArthur to Fishkill on the back of his horse to her dying husband’s bedside, but she was too late. fold3.com images #9971967, #9971963 and his pension file. Born on Long Island, he was in Captain Jacob Wright’s Company, Colonel John Lasher’s Regiment. He died March 28, 1777. A soldier with the 10th Pennsylvania Regiment. He died at Fishkill on September 22, 1778. “Pennsylvania Archives – Second Series,” published under direction of Matthew S. Quay, Sec’y of Commonwealth, Volume X, page 711, 1890. Allen County Public Library Genealogy Center; fold3.com image #3069775. Maddison enlisted as a Corporal in 1777 for the duration for the war. Serving in the 5th Pennsylvania Regiment, Captain Isaac Seelyâ€™s Company, he was promoted to Sergeant between April/May 1778. He was sick at Fishkill from 25 September 1778 until death on or before October 3rd. He is not listed in later Muster Rolls. His wife was given his pay- Rect. No. 5 for 3 Pounds 15 Shillings on 3 October 1778.
fold3.com Revolutionary War Rolls, PA Revolutionary War Rolls Folder 26 page 64; PA Service Record pages 13, 14,20 & 23. Bartley of the Virginia Artillery served in the 1st Regiment of Artillery commanded by Col. Charles Harrison, Captain James Pendleton's Company. He was listed as sick at Fishkill hospital from Sep. 12, 1778 and died sometime in October of that year. fold3.com Revolutionary War Muster Rolls, Continental Troops, 1st Regiment of Artillery Folder 28 - pages 15, 17 & 19; Continental Troops Service Record - pages 11, 13 & 15. Browning enlisted for 3 years in Captain Thomas Minor's Company of the 2nd Virigia State Regiment. He was sick at Fishkill in September and reported dead in October, 1778.
fold3.com Revolutionary War Muster Rolls, Virginia 2nd State Regiment (1777-79) Folder 63 - pages 8 & 11; Service Record - pages 4 & 6. Chowning enlisted on 21 April 1777 for 3 years in the 5th Virginia Regiment of Foot, later known as the 5th & 11th Consolidated; Captain Thomas Hill's Company. He is listed as in the Fishkill Hospital in January 1779. A later muster roll listed him as died on 18 February 1779.
fold3.com- Revolutionary War Rolls, Virginia 5th & 11th Regiment Folder 159, pages 2, 5, 8, 11 & 17; Service Records page 39, 41 & 45. Private Debough enlisted on Feb. 13, 1777 for 1 year in Captain Peter Minor's Company, 5th Virginia Regiment of Foot. He was reported sick at Fishkill in September, 1778 and died on October 20, 1778.
fold3.com Revolutionary War Muster Rolls, 5th & 9th Consolidated Virginia Regiment (1778) Folder 15 - pages 16 & 19. Private Gibson enlisted on February 14, 1778 for 1 year in the 3rd and 7th Virginia Regiment. He is reported sick at Fishkill in Sep. & Oct. 1778 and reported dead on October 28th of that year. fold3.com Revolutionary War Muster Rolls, Virginia 3rd & 7th Regiment Folder 92 - pages 11 & 14. Hadden of the Virginia Artillery, served with the Continental Troops in the 1st Regiment of Artillery commanded by Col. Charles Harrison, Captain Drury Ragsdale's Company. He was reported sick at Fishkill in September 1778 until his death on November 10, 1778.
fold3.com Revolutionary War Muster Rolls, Continental Troops, 1st Regiment of Artillery Folder 30 - pages 15, 17 & 19; Continental Troops Service Record - pages 2, 3, 4, & 10.
fold3.com Revolutionary War Muster Rolls, Virginia 3rd and 7th Regiment of Foot Folder 91 - pages 5 & 8; Service Record - pages 17 & 21. Johnston enlisted for 3 years in Captain Francis Willis' Company of Colonel William Grayson's Regiment of Foot of Virginia. He was reported sick at Fishkill from June through September 1778 and then "said to be dead" in October. fold3.com Revolutionary War Muster Rolls, Continental Troops, Grayson's Regiment Folder 128 - pages 44, 47 & 50; filed under Samuel Johnson Service Records - pages 10, 11 & 13. Lively enlisted on December 3, 1776 for 3 years in Captian Thomas Minor's Company in the 2nd Virginia State Regiment. He was sick at Fishkill from October until he is reported as dead in December, 1778.
fold3.com Revolutionary War Muster Rolls, Virginia 2nd State Regiment Folder 63 - pages 11, 14 & 17; Service Record - pages 7 & 8. Private Poor enlisted on Feb. 16, 1778 for 1 year in the 9th Virginia Regiment of Foot under Col. Burges Ball which later became the 5th & 9th Consolidated Regiments. By August, 1778 he is in the Light Infantry. In October of 1778, he is listed in the 1st Regiment, Captain Charles Pelham's Company as sick in Fishkill and reported dead in February, 1779.
fold3.com Revolutionary War Muster Rolls, 1st Virginia Folder 15 - pages 34, 37, 40 & 43; Service Records - pages 7, 13 & 19. Ray enlisted on November 22, 1776 for 3 years. He was in Captain Mayo Carrington's Company of the 5th and 11th Virginia Regiment of Foot. He was sick at Fishkill in September 1778 and died in January 1779.
fold3.com Revolutionary War Muster Rolls, 5th & 11th Consolidated Virginia Regiment Folder 158 - pages 2, 5, 8, 11, 14 & 17; Service Record - pages 23, 24 & 25. Private Russell enlisted on April 6, 1778 in Fauquier County for 3 years, reporting for duty 9 days later. He was reported sick at Fishkill in Sep. 1778 and dead on October 31, 1778.
fold3.com Revolutionary War Muster Rolls, 6th Virginia Regiment of Foot Folder 181 - pages 2 & 6; Virginia Service Record - pages 4, 5 & 11. Saunders enlisted in the Continental Army on February 13, 1778 for 3 years. He was sick at Fishkill in October 1778 while in Captain Peter Minor's Company of the Virginia 5th Regiment of Foot. A month later he is listed in the 3rd Regiment under Lieut. Col. Thomas Gaskin's Company and is reported dead in December 1778.
fold3.com Revolutionary War Muster Rolls, 5th & 9th Virginia Consolidated Regiment of Foot Folder 151 - page 19 and the 3rd Virginia Regiment of Foot Folder 82 - pages 2 & 5; Service Records 3rd Regiment pages 6, 13 & 14. Samuel Cone served in the 1st Canadian Regiment of Col. James Livingston, Captain Peter Van Rensselaer's Company and had enlisted for 3 years. He was listed in the General Hospital on the Fishkill muster roll dated May 4, 1778 as dying on May 3rd and later verified on the muster roll taken at Peekskill in June. fold3.com - Revolutionary War Rolls, Continental Troops, Livingston's Regiment (1777-80). Folder 223 page 16 & 20; Continental Troops Livingston's Battalion Service Record pages 6, 7 & 8. Abraham Haney (Hanion, Hany) served with the Continental troops in James Livingston's 1st Canadian Regiment, Captain Dirick Hanson's Company. He enlisted on 7 June 1777 for 3 years and was sick at the general hospital when muster was taken on May 4, 1778 in Fishkill. He died the same day. fold3.com - Revolutionary War Rolls, Continental Troops, Livingston's Regiment (1777-80). Folder 218 page 14 & 17; Continental Troops Service Record Hanion page 2, Haney page 4 and Hany page 5. Born in Quebec in 1743, Lt. Pelland joined Colonel Hazen’s 2nd Canadian Regiment Information The 2nd Canadian Regiment, also known as Congress' Own or Hazen's Regiment, was one of a small number of Continental Army regiments that was the direct responsibility of the Continental Congress (most regiments were funded and supplied by a specific state). Under the command of Colonel (later Brigadier General) Moses Hazen for its entire existence, all or part of the regiment saw action at Staten Island, Brandywine, Germantown and the Siege of Yorktown. dying from Smallpox at Fishkill in 1778. The son of Edward Ralls and Mary Raleigh of Stafford County, Virginia. He enlisted in Feb. 1778 for 1 year. He served in the 3rd, 4th and 7th Virginia Consolidated Regiments. Ralls was listed as sick from Sep. through Apr. 1779 at Fishkill. 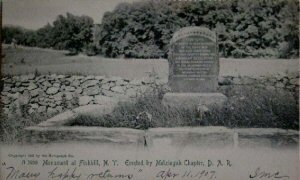 Family histories on Ancestry.com mention a letter written by his brother who mentioned Bethlehem died at either Peekskill or Fishkill, which is also referenced in his brother Kenaz's pension file. * For this reason, Private Bethlehem Ralls will remain a notable until we can verify where he died. fold3.com Revolutionary War Muster Rolls, 3rd Virginia Regiment Folder 80 - pages 2, 5, 8, 11, 14, & 17. Kenaz Ralls pension file - pages 31 & 32 and Ancestry.com "Family histories for the Ralls family." Private Rowland enlisted on June 18, 1778 for 9 months in the 4th Vacant Company under Lieut. Colonel Ludwig Weltner in the German Regiment of the Continental Army. He was reported sick in camp at Fishkill in September and died October 21, 1778. *note: Rowland is listed here because the German Regiment included men from Maryland, Pennsylvania and other states. fold3.com Revolutionary War Muster Rolls, German Regiment Folder 2186 - pages 307 & 310; Continental Troops Service Record - pages 3, 8 & 11. In leiu of new information, Jesse Dillion has been removed from our list. In tandem with an outside researcher it was proven that Dillion lived well beyond the war. FOFSD notation: Josiah Graves Sr. has been verified and is listed in the State of Massachusetts. May the others rest in peace with the knowledge that although we may never learn their full names we will never forget them. A History of the Cutter Family of New England by Benjamin Cutter, William Richard Cutter. The Compliation of the late Dr. Benjamin Cutter of Woburn,Mass. ; Boston: David Clapp & Son 1871. page 321. Disclaimer: This is a living tribute to those buried at the historic Fishkill Supply Depot. Names appearing herein are reflective of our group's intensive research and are based, where available, on primary sources. As new information is developed, the content of this tribute may change.